The BRS Sherpa took the judging panel by storm. The tough, popping aesthetics of the exterior engaged their curiosity, and the componentry and interior built upon their original excitement. 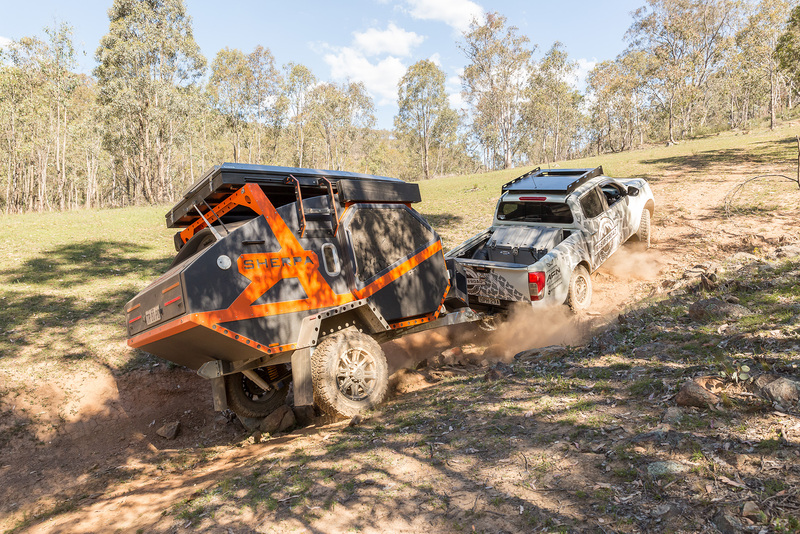 The conversation about this radical rethink of the teardrop style flowed with ease, with one key point emerging: this is an offroad powerhouse sure to triumph in even the harshest outback. Every few years, the REDARC CTOTY judges are presented with a new release that really grabs our attention and gives us the tingles. I got that excited feeling when I cast my eyes on the all-new and totally unique BRS Sherpa. Now, even after that initial thrill has calmed down, I can safely say the new Sherpa has stolen my heart with its terrific combination of smart ideas, bushability, comforts and functionality. This magnificent presentation is based on a very strong and unique solid centre beam and H-frame chassis, that can only be referred to as skeletal. It’s immensely strong, and that’s where it starts. 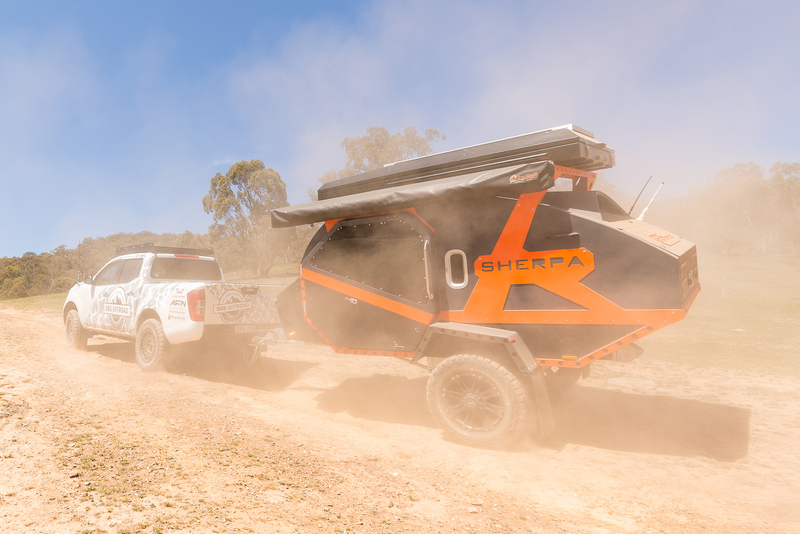 BRS use a terrific mix of raw materials in the construction, from a hot dipped galvanised main beam, to aluminium ribs and insulated body panels, to a fibreglass tub producing a trailer that weighs only 1040kg Tare when fully-opted as displayed. The engineering is a modern delight and the ideas brilliantly executed. It is basically a teardrop shell that, at first glance, might seem a little claustrophobic; but climb inside and you won’t want to leave. The interior has a very spacious feel, despite all the comforts, including the TV and sound system, plenty of functional storage, a couple of fans, and a beautiful star gazer’s window (just the thing for a clear night in the open). The entry is via a large doorway either side, that has flyscreen protection should you wish for even more fresh air and spacious feeling. The innovation includes the use of a strong 200L water bladder, hi-tech bonding processes, the elimination of all gas components with an alcohol stove and Eberspächer diesel heater/hot water system, remote locking doors and a brilliant kitchen at the rear that folds, lifts and converts. 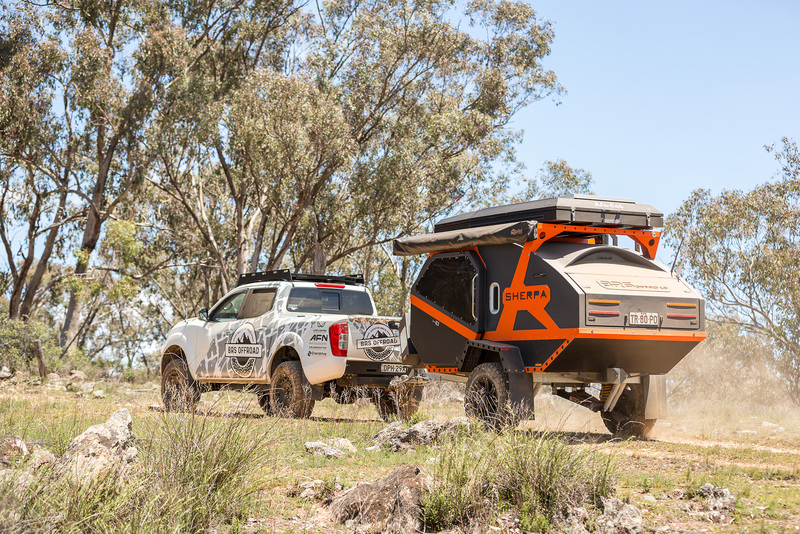 Up on top is an optional Alu-Cab rooftop tent; however, leave it off and there’s plenty of options to carry small boats, canoes or kayaks, bicycles or your choice of travelling toys. The finished quality is simply superb, making for camping eye candy with its striking black outfit with orange trims. 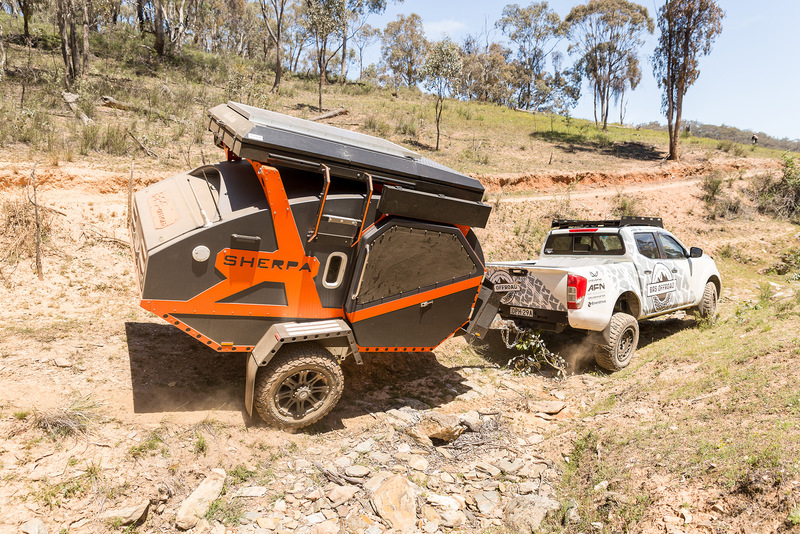 If BRS intended to make a statement of premium Australian ingenuity, design and construction, they certainly succeeded with their all-new Sherpa. 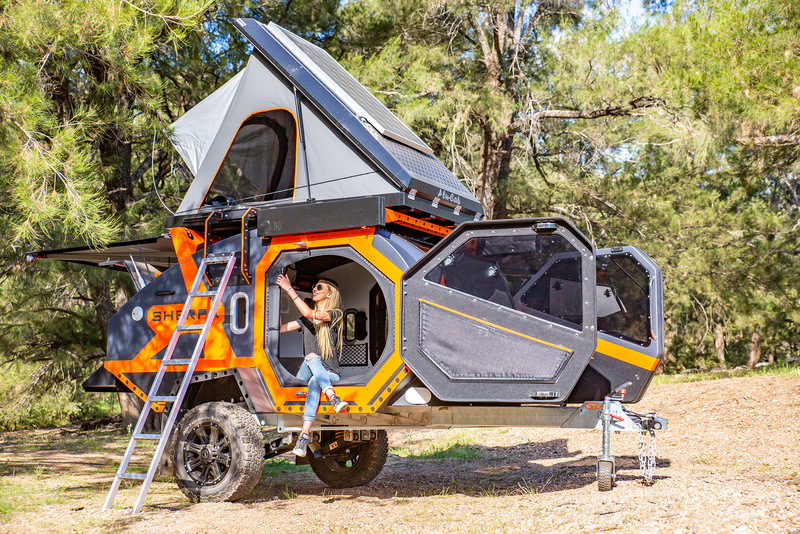 This is a serious offroad unit that will be ideal for an adventurous couple, a lone explorer, or maybe even a family with slightly older kids that are capable of climbing the ladder to the rooftop tent! More camper than most hybrids, the BRS Sherpa stands out from the crowd and makes a statement right from the start with its unique shape and striking colour job. 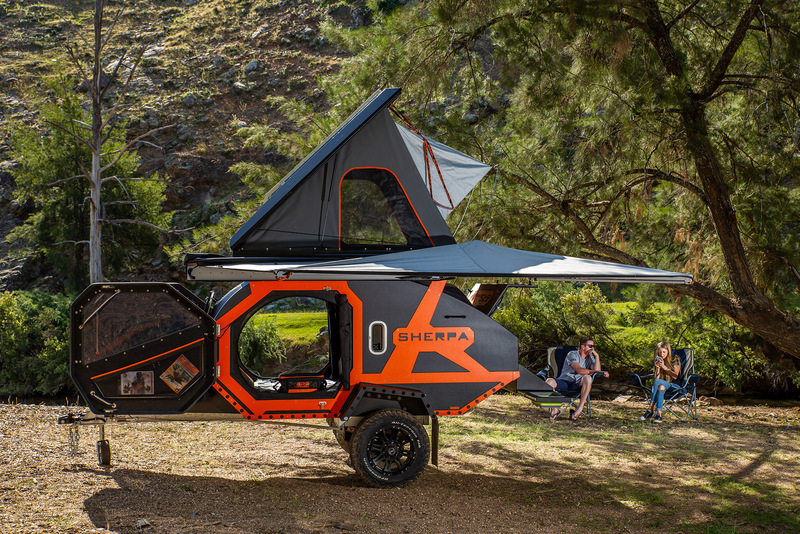 You may classify it as a ‘teardrop’ camper, but this is a teardrop with attitude, macho stance, capability and rugged endurance. If you can tear your eyes off the outside and the interior, and manage to look underneath, you’ll find that the innovation and great design continues. The chassis is made up of a 150x100x4mm RHS centre beam which stretches right through from the DO35 coupling to the back recovery points. From this centre ‘backbone’, a series of 5mm thick CNC-cut ribs are spaced along the length of the chassis, which supports the body. The lower body of the Sherpa is made from 3mm 5083 marine grade plate alloy, with a double skin and an air pocket between to help insulate the cab. The top part, or ‘cone’, is made from a 20mm thick composite panel, which is extremely strong and helps give the Sherpa its distinctive shape. A high quality Cruisemaster XT suspension is standard and can come with coil springs or with airsprings, with our test rig being fitted with King Springs coils, each backed up by a pair of high calibre, custom-tuned shocks. This suspension is now in its fifth generation, with many years of testing and development, and use over thousands of kilometres of back roads and tough tracks. That heritage has resulted in the suspension being one of the most outstanding trailing arms suspensions around in Oz at present, rated with impressive 2.8T and 4.45T ATM load ratings. Finishing off the suspension is a pair of 17x8 CSA Raptor rims fitted with top quality BFG all-terrain tyres, while 10 inch electric brakes help the trailer pull to a stop. All up the camper weighs in with a Tare of just 1040kg – a very impressive figure given everything – with an ATM of a very useful 1600kg. Bottom line: this camper is awe-inspiring and its offroad-ability is up there with the best of them. Coupled with its gutsy lithium battery, solar system and 200L water capacity, you could live off the grid, essentially, for as long as you wanted. The Sherpa did more than just turn heads as it rolled into Mudgee. There was an air of anticipation and excitement about what might be in store for us inside its striking grey and orange shell. Top marks for X-Factor! The Sherpa is somewhat of a reinvention of the teardrop camper and when the judges finally got to have a good look around, in and under this unique RV, we certainly weren’t disappointed. We started our judging at the rear kitchen and were impressed with the innovation on show, including the design of the compartmentalised pull-down pantry, the two 30L Engel fridge/freezer drawers, the storage drawer that slides out and drops down to a user-friendly height above the good-sized preparation bench, and the two-burner metho stove. Stepping inside the main cabin via one of the twin access doors feels a little like stepping into a spaceship. Inside, you’re greeted by a small but tasteful sleeping compartment, in which all details have been considered. A clip-off mat sits across the mattress, providing a home for your camp table and chairs in transit, which can then be rolled up and stowed when not in use. 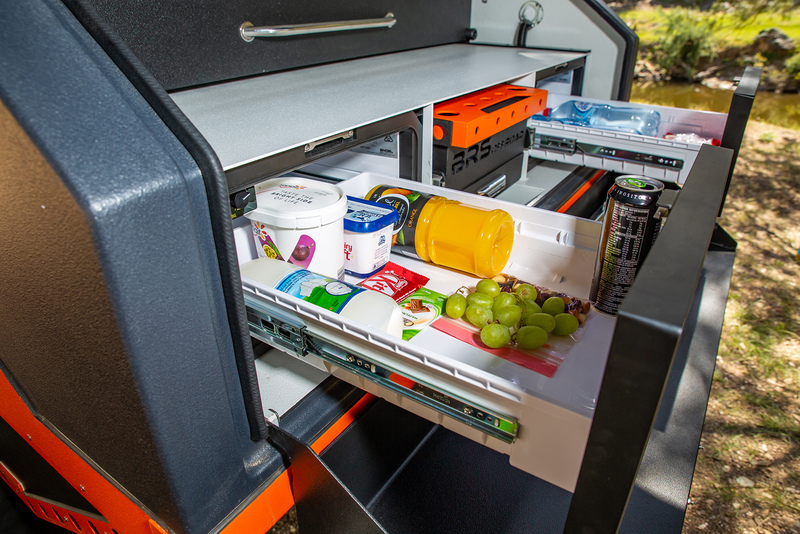 Storage has been maximised throughout the cabin and soft bags are provided for your clothing. Cushion backs at the head of the mattress allow you to recline to watch a DVD on the screen mounted to the wall at your feet, and a ‘moon roof’ window provides pleasant night-time views. You’ll be kept warm by the Eberspächer diesel hot water/space heater, or cool via twin-mounted 12V fans and the cross breeze through the open doors, which have zippered midge-proof mesh screens. 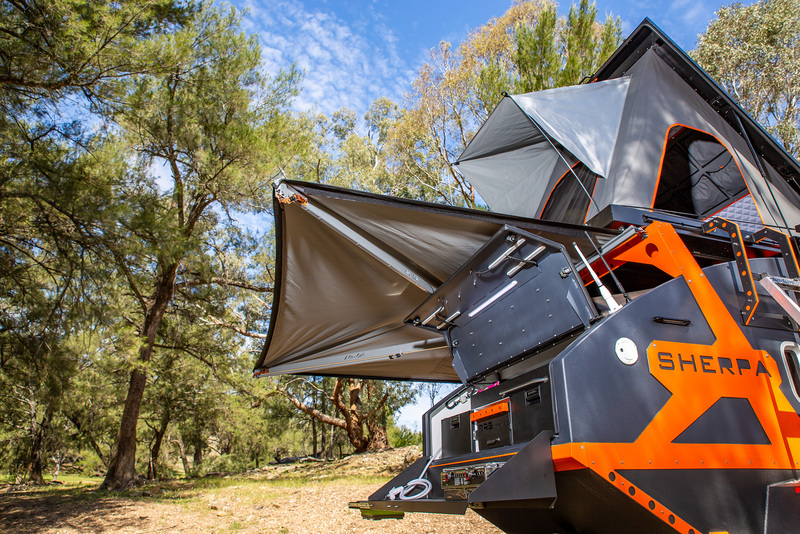 A ‘quick pitch’ fold-down ensuite tent is attached to the camper’s side for privacy while you bathe or change, and the wrap-around awning provides decent covered living space. 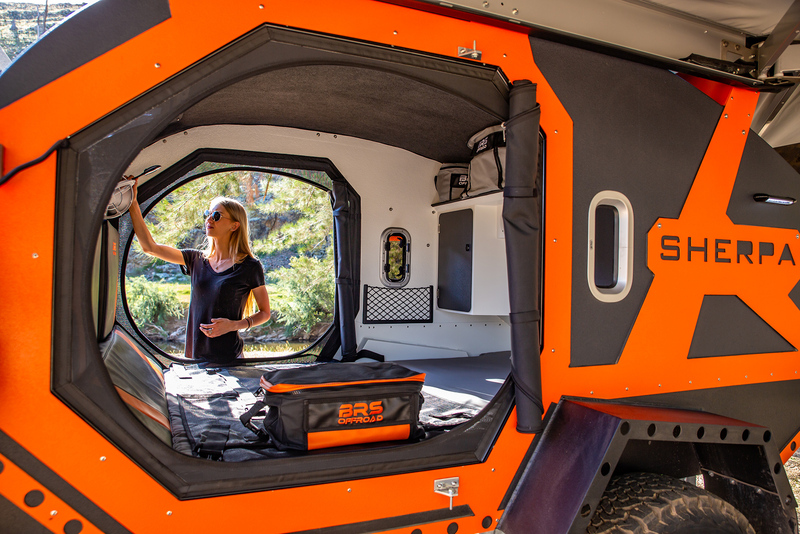 Ben has designed the Sherpa to be versatile and, with the addition of an Alu-Cab rooftop tent, you’ve got sleeping quarters for four within a very small footprint. The BRS Sherpa gave us innovation in big doses, having been designed and built specifically with the US market in mind. This is where the traditional teardrop meets the twenty-first century and it does so with little subtlety and plenty of pizzazz. Since our introduction to this camper in May, the prototype has been massaged into something more refined and complete, but it still achieves the end result with the same brashness. Electrical power comes from an Enerdrive 125Ah B-Tec lithium battery, kept in shape by an Enerdrive 40A DC-DC charger and 20A mains charger. Atop of the Alu-Cab rooftop tent is a 200W solar panel and, with 6B&S cable from the drawbar USB plug, keeping the battery at its optimum shouldn’t be hard. All this travels in the front box, adjacent to the Eberspächer diesel hot water and space heater. Around the camper are four 4.8A USB and two 12V cigarette plugs. This was one of the few campers we saw where the USBs outnumbered the cig plugs and where there was better than 2.1A charging capacity. Like its bigger Pursuit brother, the Sherpa has a range of electronic features, including wireless electronic entry into the large passenger side door, as well as a 21 inch LED TV and Fusion stereo system. Lighting includes two internal flexi reading lights, a 600mm light bar above the kitchen and two external lights. The inclusion of a 200L water bladder, rather than a fixed wall tank, made for a unique fit-out choice. Water is fed to a pull-out hose and hand tap for the collapsible silicone sink, and to a pull-out hand tap at the drawbar for the ensuite. With cooking done on a spirit stove there’s no need for gas in this camper. 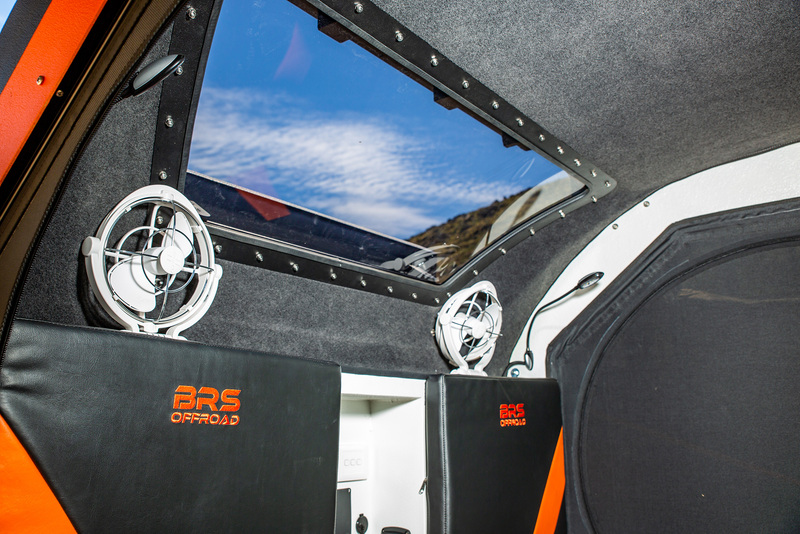 There is innovation aplenty throughout the BRS Sherpa. It makes the ‘must look at’ list for any couple seeking a competent, light-weight camper that will grab attention.